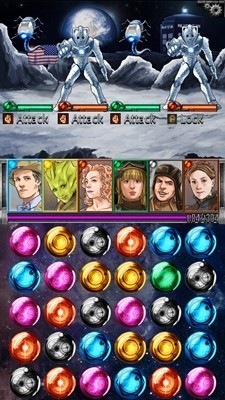 What do you get when you combine Doctor Who, a gem matching game, and a role playing game? If you package it all into a cool mobile app with nicely drawn images of the Doctors and his various companions, you get Doctor Who: Legacy. The story is simple. The Doctor is taking a trip with Madame Vastra (a reptile-lady from a species that pre-dated humans on Earth) when they meet up with some Sontarans (a clone race of warriors that bear a striking resemblance to potato-men). You help the Doctor and Vastra fight them off, but the bigger problem is that the Sontarans shouldn’t be there. They’ve figured out time travel and are messing around with history – trying to make every war a Sontaran victory. The Doctor sets off to stop the Sontarans by visiting points along his timeline in reverse order. The best part of the game, though, are the graphics and layout. The games levels ("episodes") go in reverse order from more recent Doctor Who episodes to less recent ones – with a few additional confrontations tossed in for good measure. Fans of the series will be treated to familiar scenes as whole episodes are reenacted in a turn-based RPG/puzzle game format. Daleks from Asylum Of The Daleks must be fought against in "human-turned-into-Dalek-zombie" form, "broken down insane Dalek" form, and fully functioning Dalek form. Cybermen from Nightmare in Silver appear in "Chess playing Cyberman", Cyberman, Cyber-mite, and even Cyberman-Doctor (aka "Mr. Clever") forms. Many enemies will have unique attacks such as locking out gems (preventing you from moving them for a few turns), altering gem colors, or stealing all gems of a certain color. Enemies also attack at different rates. Some will attack every turn, others every two or three turns. In addition, different companions can be more or less effective against certain enemies. This leads to certain strategies as to which gems to match up and when or which companions to add to or remove from your party depending on the enemies you will be facing. So far only seasons 7 and 6 of the new Doctor Who are included. However, there are still many levels to play, many enemies to battle, many companions to collect, and even many different costumes for the companions and the Doctor to unlock. (For example, I now have Doctor eleven in a Stetson because Stetsons are cool. I can’t wait to unlock the fez, though.) The developers have stated that they won’t be satisfied until they release a level for An Unearthly Child (the first Doctor Who episode that aired 50 years ago). This means that there should be plenty of levels coming up. Given the amount of new levels there are (either included in the game now or promised for later) and the fact that old levels can be replayed again and again (to help level up new characters or just to relive favorite battles), I don’t see this game getting old anytime soon. This is a must-play for any Doctor Who fan, especially when the next episode seems oh so far away. 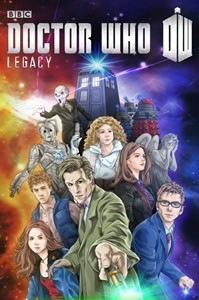 Doctor Who: Legacy is made by Tiny Rebel Games and is available for free on Android or iOS. It is released under a freemium model: It is free to play, but you can purchase time crystals using real money instead of waiting for them to randomly drop during battle. One last tip: Be sure to visit the Doctor Who: Legacy Facebook Page for some promo codes that unlock new characters and costumes. NOTE: I did not receive compensation for this review. In fact, I was not asked in any way to review this game. I only reviewed this as a Doctor Who fan who loved playing the game.